Security-Tek will collect and recycle all electronic and computer related equipment in the Portland Metropolitan and Vancouver area. We extend our services to businesses, schools, churches, organizations and individuals. We can pick-up your items for an small fee. The cost varies according to the distance that our truck has to travel to pick up your items. 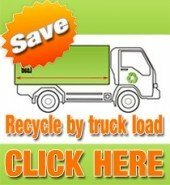 Unlike most other recyclers we do not charge for everything we receive, but only for those items that are costly to recycle and / or difficult to haul. This can save a company hundreds or even thousands of dollars in disposal costs alone. Get started with our easy online Electronic Recycling Program. It is a simple 4 step program, which gives you an instant quote tailerd to meet your needs. The whole process takes less than 60 seconds to complete, depending on what you have to recycle. Are you forced to downzise? What will you do with the excess furniture, filing cabinets, desks, chairs, computers and monitors? Typically there will be boxes filled with miscelaneous items such as modems, cables, CD’s, keybords, mouse devices etc… No need to worry, we will come and haul it away. We will not only remove your recyclables from your office or store room, but we will also leave it in a broom swept clean condition. No matter how big or small the job we can do it. To get started schedule your Office Clean Out online and we will do the rest. Need a discount? If you have a large amount of items that you want to recycle, we will be willing to negotiate a discount price to suite your budget. We are also willing to work with companies that have a large amount of items that needs to be recycled and can not afford the cost associated with recycling. Our customers includes schools, and non profit organisations.